This book addresses the complexity of Islam in Thailand, by focusing on Islamic charities and institutions affiliated to the mosque. By extrapolating through Islam and the waqf (Islamic charity) in different regions of Thailand the diversity in races and institutions, it demonstrates the regional contrasts within Thai Islam. The book also underlines the importance of the internal histories of these separate spaces, and the processes by which institutions and ideologies become entrenched. It goes on to look at the socio economic transformation that is taking place within the context of trading networks through Islamic institutions and civil networks linked to mosques, madrasahs and regional power brokers. Brown casts this study of private Islamic welfare as strengthening rather than weakening relations with the secular Thai state. The current regime’s effectiveness in coopting these Muslim elites, including Lutfi and Wisoot, into state bureaucracies assists in widening their popular base in the south, in the north-east, and in Bangkok. Such appointments were efficacious in reinforcing the elite’s Islamic identity within a modern, secular, literate, and cosmopolitan Thai culture. 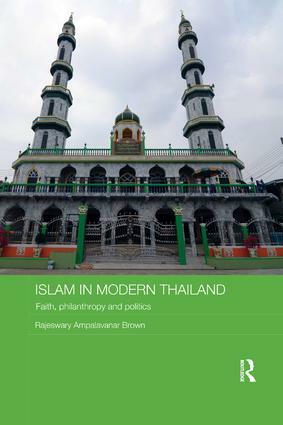 In challenging existing studies of Thai Muslims as furtive protest minorities, this book diverts our attention to how Islamic philanthropy provides the logic and dynamism behind the creation of autonomous spaces for these independent groups, affording unusual insights into their economic, political and social histories.